Great to use for memory books, photo albums, decorations, creative play & more! 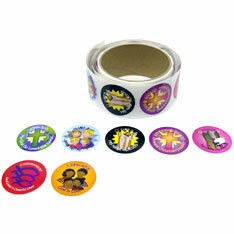 Perfect incentive for Sunday School Classes or Wednesday Bible Study these are sold by the roll, 100 stickers per roll. $1.30 per roll for 100 rolls or more. $1.15 per roll for 200 rolls or more.